Our Reykjavik Iceland travel vlog: how we spent an amazing day in Iceland’s capital city. Very exciting news, guys! We’ve got the first part of our Reykjavik Iceland travel vlog series ready for your viewing pleasure. This was actually our second day in Iceland. Our first day involved wandering around like zombies with jet lag, collapsing at our apartment, napping until 9:00 at night, and cooking a meal at our place. There wasn’t really anything video-worthy about that day, trust me. Here’s the Reykjavik Iceland travel vlog that I keep mentioning! 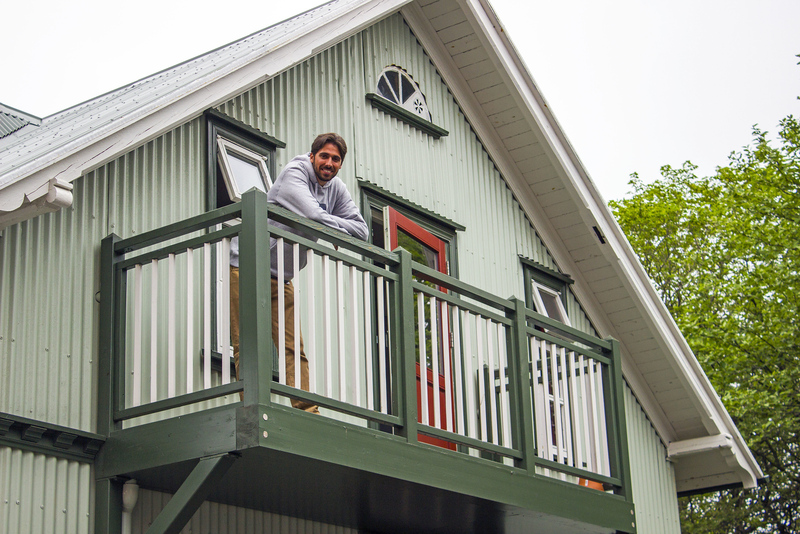 We hope you enjoy our little journey around Reykjavik to check out its sights and sounds. Please let us know if you have any questions about visiting this wonderful city. The second day of our trip was really our first day of adventure. This Reykjavik vlog is all about arriving in Iceland and exploring Reykjavik for the day. We stumbled upon all kinds of neat places. Justin and I discovered intriguing street art. 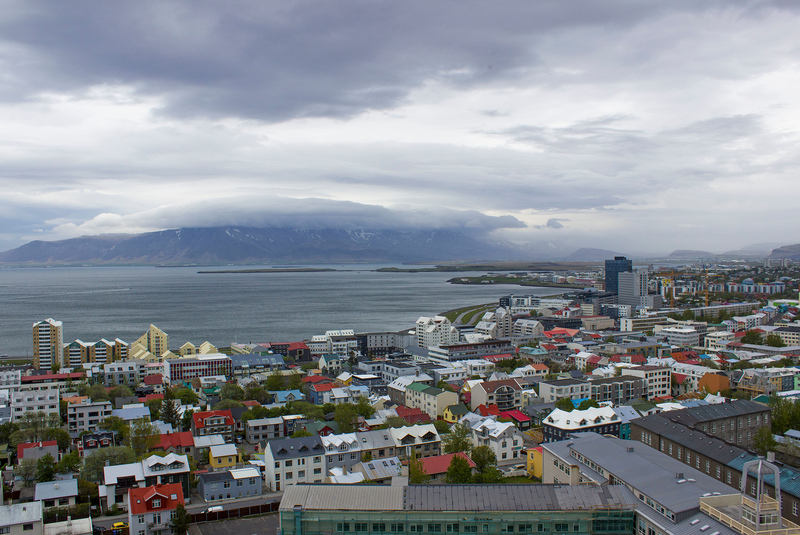 We went to the top of Hallgrimskirkja church (in the video, you get to hear me try to pronounce the name of the church…yikes!) for an outstanding view of the city. The two of us walked along the harbourfront, admiring the Sun Voyager statue. Harpa, the concert hall, was a highlight of our day in Reykjavik. If you’re looking for more information on what to do, be sure to watch this Reykjavik daily vlog below. We highly recommend that you watch our Reykjavik travel video to get a true feel for the interesting vibes of the city. It’s a very colourful and bright city, even though the weather might be dreary at times. There are buildings in a rainbow of colours, as well as vibrant street art. If you’re seeking vegan food in Reykjavik, you don’t have to look too hard for it. 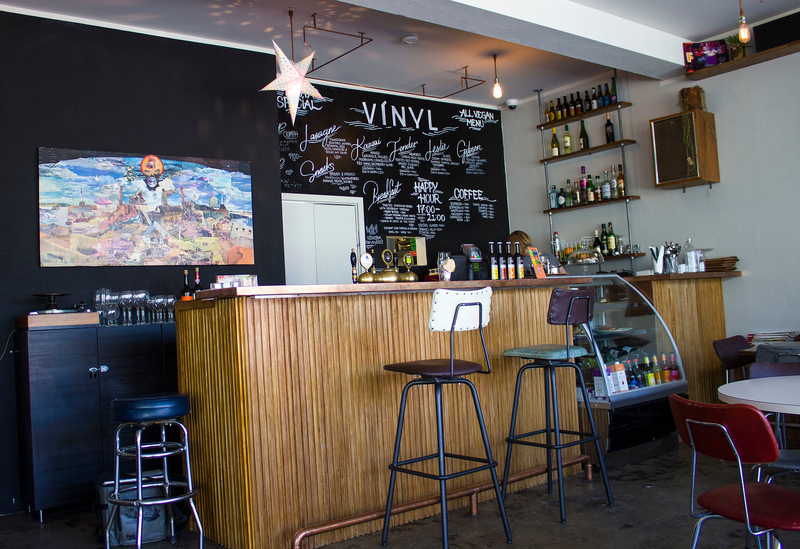 We highly recommend that you check out Kaffi Vinyl, which was Reykjavik’s only vegan restaurant at the time we were there. The vegan options are always expanding, which is awesome. Kaffi Vinyl is a vegan restaurant and a record shop, making it a really cool little spot in the city. Seeking somewhere to rest your head at night? 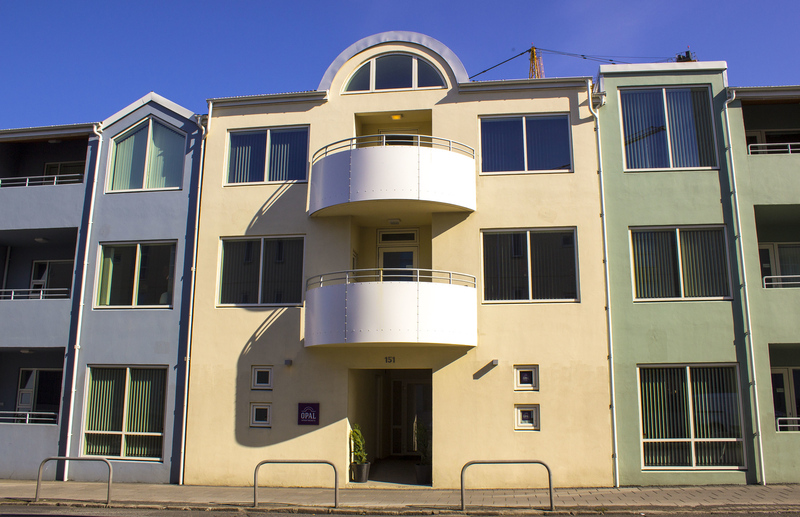 On our first day in Reykjavik (at the time of shooting the video for this Reykjavik Iceland travel vlog), we stayed at Opal Apartments, just down the street from Iceland’s main shopping street. You can book your stay for Opal Apartments here, and read more reviews on the apartment by clicking here. On our last night in Iceland, we stayed in Reykjavik once again before flying out the next day. We stayed at a second apartment in Reykjavik, Old Charm Reykjavik Apartments. This apartment was right in town so we could be anywhere within moments. It was another cozy and lovely apartment to rest our heads at night. You can book your stay by clicking here or read more reviews from fellow travellers. 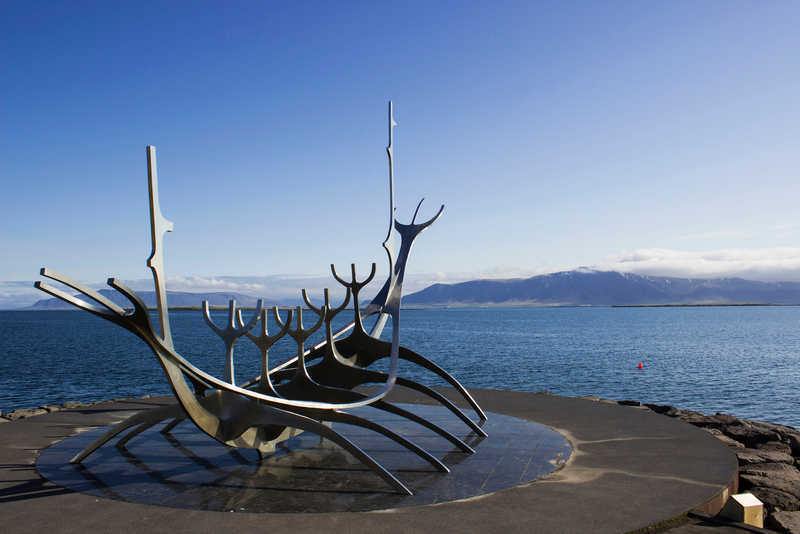 If you’re starting your trip out in Reykjavik and using it as a starting point for a lengthier trip around the country, please check out our Iceland 2 week itinerary. It’s chock full of information all about our adventures around the country. We’ve done all the planning for you, so check out our informative guide if an Iceland trip interests you. Check out the rest of our Reykjavik travel photos by clicking here. PIN this image to your Pinterest by clicking the button on the top left corner. 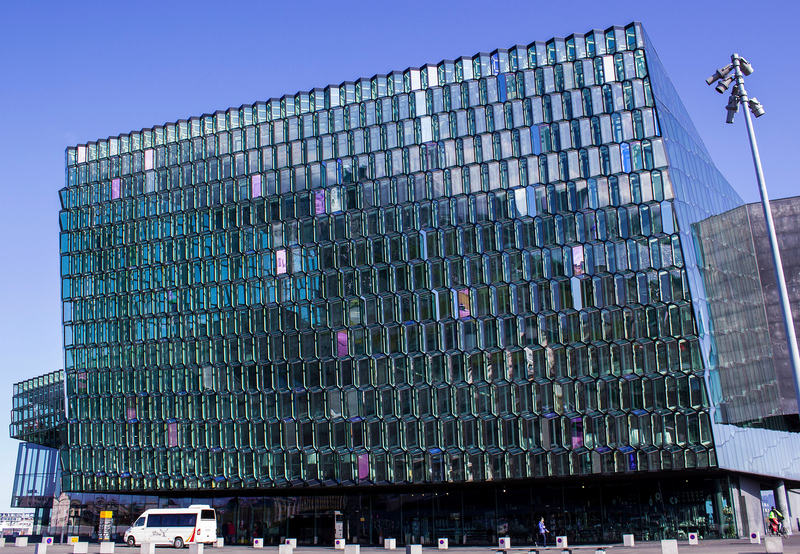 Have you ever visited Reykjavik? Do you want to? Ask us any questions you might have! I love all the street art! Iceland is in our top 5, can’t wait to go! That’s awesome! That church is beautiful – and so iconic. Good for you for at least trying to pronounce it – you are braver than we are! Looking forward to Part 2! Nice. 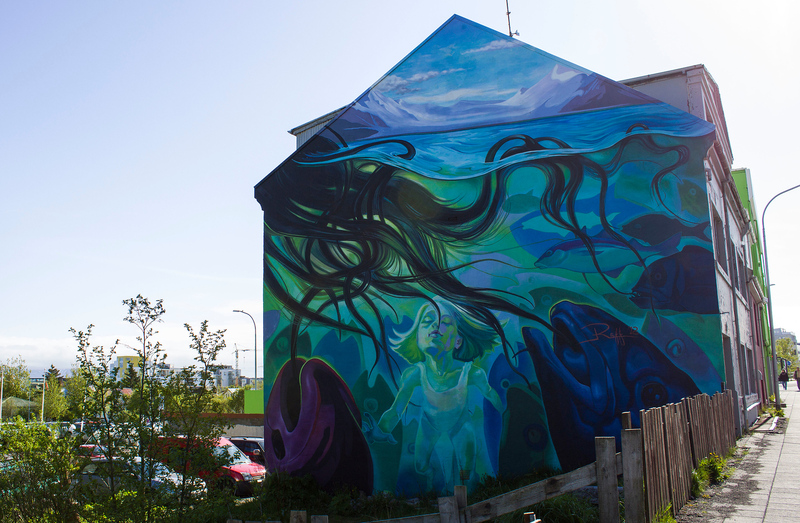 There’s so much cool and useful stuff to do in Iceland that some people forget that Reykjavík is a pretty amazing city in its own right.